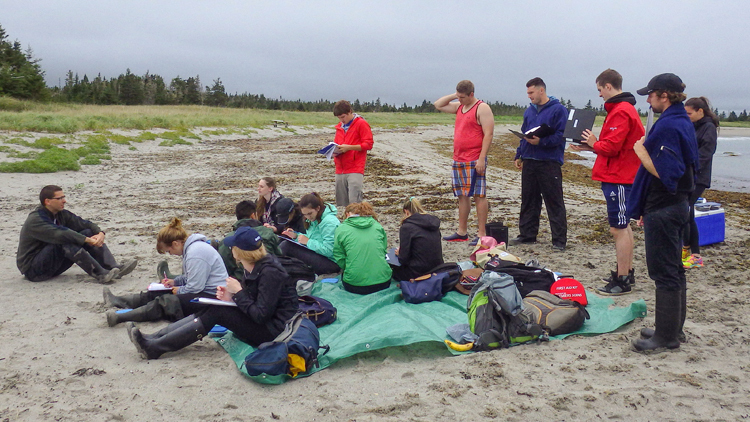 StFX biology professor Dr. Russell Wyeth (at left) teaching a class on the beach. He says this setting is a favorite place to start students down the path of scientific teaching as it’s a place where students so easily generate many great questions about biology. Helping students develop their scientific logic is the subject of a new paper recently published by StFX biology professor Dr. Russell Wyeth. The paper, “Patterns vs. Causes and Surveys vs. Experiments: Teaching Scientific Thinking,” was published in the American Biology Teacher, and is co-authored with Quest University Canada life sciences professor Dr. Marjorie Wonham. Dr. Wyeth says the focus of the paper is on sharing their approach to teaching students how to think about the scientific method. “Science can be described as a fairly straightforward progression: a question leads to a hypothesis that is then tested. Scientists think through this progression all the time, but scientific teaching tends to only give students examples rather than actually teach the students how to do it. Yet many students find the progression tough to master initially,” he says. The goal of their paper, he says, was to share the simple conceptual framework, based on a clear understanding of patterns versus causes, that they’ve found helps students to substantially reduce those small errors and keep their logic tight so that do indeed generate the right hypothesis and then design a test of that hypothesis that will answer their question. “We both feel that this scientific logic is one of the most fundamental things we should be teaching students in biology, or any empirical science, for that matter,” he says. Fourth year honours StFX biology student Laura Davidson, who was exposed to Dr. Wyeth’s approach to teaching scientific thinking through a biology class she took from him in her senior year, says the approach is extremely practical and effective. Fellow fourth year honours student Molly McIntyre agrees. “Dr. Wyeth's QHT (Question, Hypothesis, Test) approach taught me to break down the scientific method into understandable components. This approach allows me to stay focused on the scientific question at hand, ensuring that my research actually tests what the study is interested in,” she says. "This method allowed me to think more clearly about the question at hand and helped me avoid getting bogged down by additional details. It also helped me extract pertinent information from somewhat complicated scientific journal articles," adds fourth year honours student Carmen Landry. Dr. Wyeth says their qualitative student feedback on teaching the QHT framework includes two clear themes. “The first is more immediate and more critical: they note the extra effort required or express frustration at the difficulty they experience as they wrestle with these concepts. We believe this feedback reflects the valuable challenge of the assignment, and is a necessary consequence of the teaching goal—to have good scientific reasoning, the challenge must be met sometime. This is why we teach the framework in stages, balancing the difficulty of the entire process with relatively small steps as we progress towards full test designs. Dr. Wyeth says their interest in the topic arose quite simply when he and Dr. Wonham were teaching together at Bamfield Marine Sciences Centre, and they had students completing substantial independent projects, and they were making mistakes with their scientific logic. They sat down and brainstormed a framework that students could use to check their ideas against to make sure their logic was sound.